Mercedes-Benz has long represented a great choice for enthusiasts that want a beautiful, well-engineered automobile that will actually crank on a cold morning. As the world’s oldest automaker, the brand’s history is littered with numerous important open and sporting cars like the famed White Knights, the dominating Silver Arrows, the elegant 540K series and the blue-chip 300 SL Gullwing and Roadster. The level of appreciation for the Mercedes-Benz marque continued to grow in 2014. While impossible to top the Mercedes-Benz W196R that sold for a world record £19,601,500 at Bonhams’ 2013 Goodwood Festival of Speed sale, this year still provided many great offerings that represented the brand well. 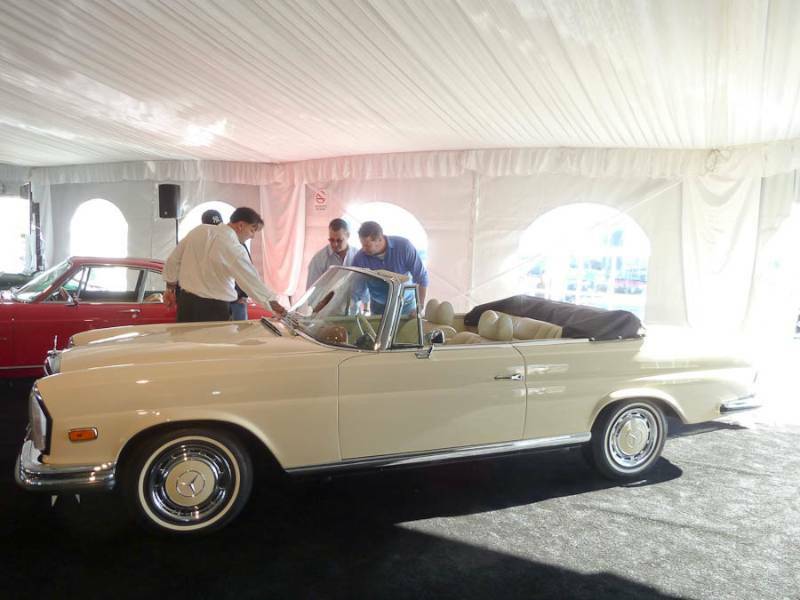 Auction Editor Rick Carey traveled across the globe to bring readers a glimpse of what was hidden inside the tents and fine hotels that hosted various collector car auctions. Not everything that crossed the block was as-advertised and Carey broke down these cars to find out the truth behind them. Lot # 194 1955 Mercedes-Benz 300SL Gullwing; S/N 1980405500594; Engine # 1989805500621; Silver-Grey/Dark Blue leather; Estimate $1,100,000-$1,400,000; Visually maintained, largely original, 2- condition; Hammered Sold at $980,000 plus commission of 10.00%; Final Price $1,078,000. Matching numbers, steel wheels, leather upholstery, Talbot mirror, full provenance, tools. No luggage. – Presented in reverse of its original colors, with silver paint and blue seats, but beautifully clean and correct. Clear evidence of careful husbandry, a consistently maintained and refurbished as needed Gullwing that has never had, or needed, a full restoration while being ministered to by recognized experts. – A Gullwing for under a million? A miracle, but one thoroughly deserved by this consistently maintained by never fully restored example. It’s a good car, and in many ways a better Gullwing than fastidiously over-restored examples costing 20-40% more, not to mention derelict hulks that seem to incite bidders into frenzies of exaggerated visions of restorations. It’s a curious phenomenon, but in the present market this Gullwing is appropriately priced. 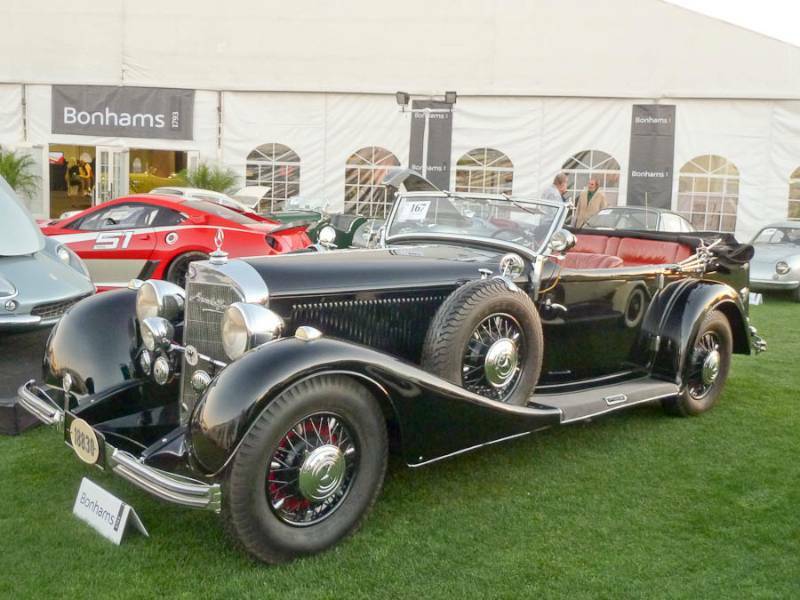 Lot # 167 1936 Mercedes-Benz 500K Sports Phaeton, Body by Sindelfingen; S/N 209421; Engine # 123724; Black/Brown leather; Black cloth top; Estimate $1,500,000-$2,000,000; Visually maintained, largely original, 3- condition; Hammered Sold at $1,300,000 plus commission of 10.00%; Final Price $1,430,000. 5018/100-160hp supercharged inline eight, 4-speed, outside exhaust headpipes, blackwall tires on steel spoke wheels, luggage trunk, 2-door close coupled Cabriolet A coachwork, dual sidemounts with mirrors, driver’s spotlight. – Quick old paint, worn, cracked upholstery, dull chrome. Handsome close-coupled two-door body with immense metal trunk. Discovered in Europe in 1951 by Dr. Ralph W.E. Cox, displayed at Winthrop Rockefeller’s museum at Petit Jean Mountain, Arkansas recently. A car that needs nothing, or everything, and has potential either way. – In a world fascinated with 500K and 540K Sports Roadsters this Cabriolet A body by Sindelfingen really stands out. The giant luggage trunk is a distraction from the clean lines of the Cab A body, but characteristic of the style of the time and its loss in search of more refined lines would detract from the period appearance. The new owner got a singular, different M-B in remarkably original and unmolested condition at a highly reasonable price that encourages its mechanical freshening and spirited driving. This is a real prize. 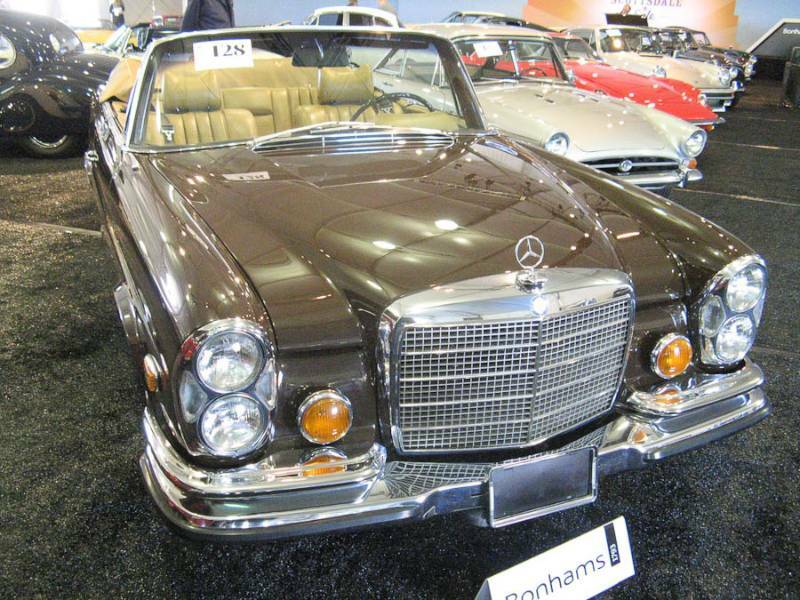 Lot # 128 1971 Mercedes-Benz 280SE 3.5 Cabriolet; S/N 11102712003741; Tobacco Brown/Cognac leather; Brown cloth top; Estimate $140,000-$180,000; Visually maintained, largely original, 2 condition; Hammered Sold at $165,000 plus commission of 10.00%; Final Price $181,500. Column-shift automatic, Behr A/C, Sony stereo installed with original Becker Europa radio included, tinted glass. From Tom Hanks and Rita Wilson. – An original car with some scuffs to the original color repaint, even patina to interior, some cracked rubber, good chrome, well preserved wood. Sound canvas top, some windshield chips, clean underhood, 65,267 mileage is very likely correct. – A sound and usable car showing good maintenance by a celebrity couple that added significantly to the value. Lot # 115 1970 Mercedes-Benz 280SE 3.5 Cabriolet; S/N 11102712002505; Engine # 11698012002300; White/White leather; Black cloth top; Estimate $225,000-$275,000; Older restoration, 2- condition; Hammered Sold at $225,000 plus commission of 10.00%; Final Price $247,500. Automatic, A/C, P/W, Becker Mexico cassette, fog lights, wheel covers, narrow whitewalls, Euro headlights. – Very good paint, chrome, interior and wood trim. Underbody has been covered in a recent coat of underseal. Orderly and correct underhood showing just a little road dust. Highly impressive and consistently presented. – Restored like new in most respects but troubling in its shiny new coat of underseal and failure to pay much attention to the engine compartment. The price paid pretty much takes into account the car’s issues. 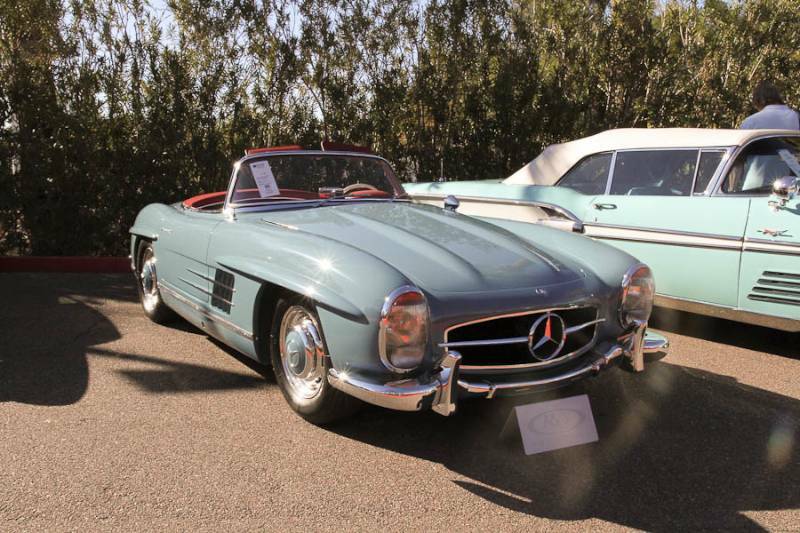 Lot # 020 1958 Mercedes-Benz 300SL Roadster; S/N 1980428500244; Engine # 1989808500245; Light Blue/Red leather; Tan cloth top; Estimate $900,000 – $1,200,000; Recent restoration, 2+ condition; Hammered Sold at $950,000 plus commission of 10.00%; Final Price $1,045,000. No Reserve – 2996/215hp, 4-speed, Michelin XWX tires, European headlights and taillights, locking filler cap, dash clock, Becker Mexico multiband radio, fitted luggage. – Excellent paint, chrome and interior. Detailed engine bay. A beautiful car with an older European restoration recently updated by SL specialists. Finished in its original, rare factory color combination and with more elegant Euro-spec lights. A choice example in an eye-catching livery. – This is what it takes to own a 300SL Roadster these days when they are as meticulously presented as this one. 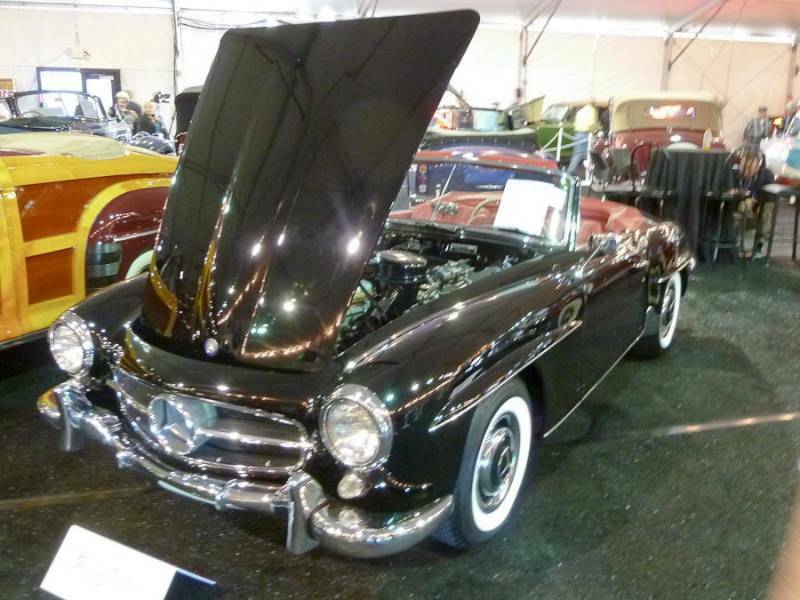 Lot # 5075 1959 Mercedes-Benz 190SL Roadster; S/N 121042109502178; Black, Dark Red; Black cloth top; Cosmetic restoration, 2- condition; Hammered Sold at $180,000 plus commission of 10.00%; Final Price $198,000. No Reserve– Hubcaps, trim rings, whitewalls. – Fresh paint and chrome. Orderly, clean and correct engine compartment. Underbody has been superficially cleaned up and repainted. An attractive cosmetic restoration. – Sold for $59,950 at Wordwide’s Auburn auction in 2010, this 190SL is not sufficiently better today to warrant the $120K increment in price even in today’s frantic 190SL market. 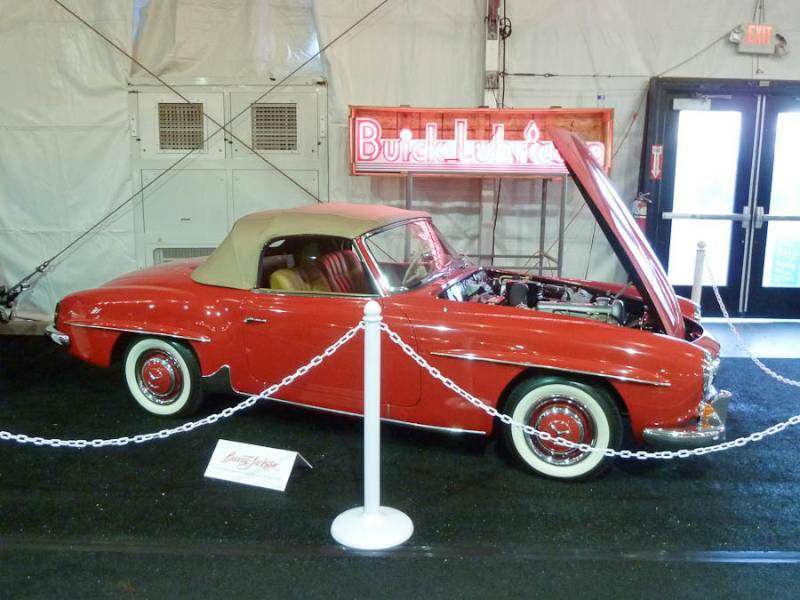 Lot # 5064 1959 Mercedes-Benz 190SL Roadster; S/N 1210409500417; Red, /Tan leather; Tan cloth top; Customized restoration, 1 condition; Hammered Sold at $175,000 plus commission of 10.00%; Final Price $192,500. No Reserve– Body color wheels with hubcaps and trim rings, whitewalls, pushbutton radio, Solex carbs. – Very good paint, chrome and interior. Engine compartment is oddly restored with incorrect shiny paint finishes. Even the carbs are clear coated. Underbody is repainted better than new. A custom car show restoration. – Remarkably and unattractively over-restored, but that didn’t deter the bidders from over-paying for it. 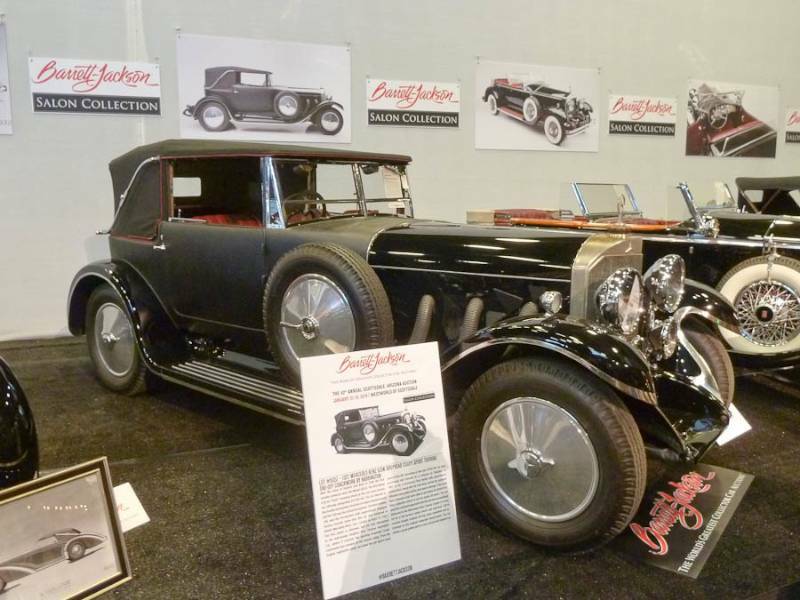 Lot # 5057 1927 Mercedes-Benz 630K Drophead Coupe Sport Touring, Body by Thomas Harrington; S/N 32019; Black, /Dark Red leather; Black cloth top; Cosmetic restoration, 3+ condition; Post-block sale at $650,000 plus commission of 10.00%; Final Price $715,000. With Reserve– RHD. Chrome wire wheels, blackwall tires, luggage trunk, Zeiss headlights, Butler fender markers, Marchal driving lights. – Good recent repaint, body covering and upholstery on a much older and largely original chassis and engine. Original coachwork as fitted in 1927, attractive, lightweight and practical. In Thailand for nearly two decades until recently and serviced by M-B Classic Center. Eminently presentable and usable as is. – Bid on the block to $375,000 but reported later sold at a price of $715,000 ($650,000 hammer.) A stylish high performance Mercedes-Benz with supercharged six developed by Dr. Porsche, but expensive. 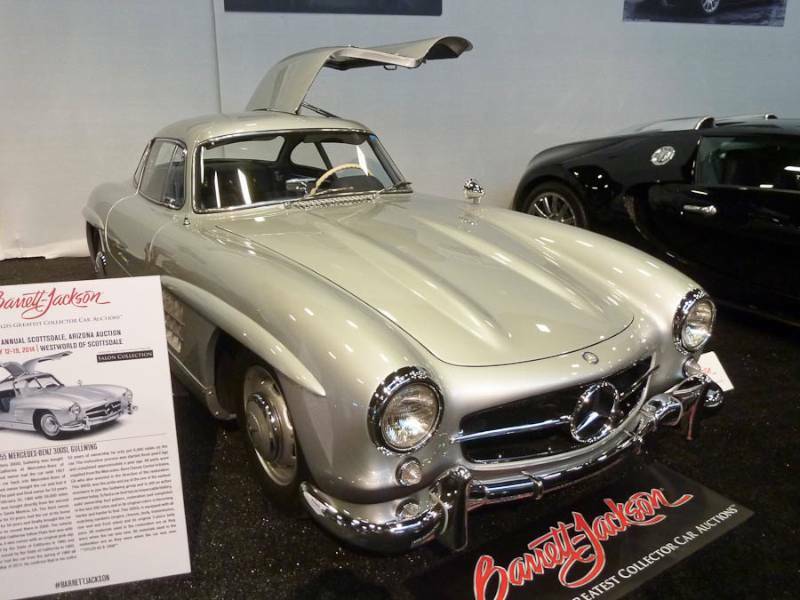 Lot # 5044 1955 Mercedes-Benz 300SL Gullwing; S/N 1980405500634; Silver, /Grey plaid; Restricted Access, not viewed closely, 2+ condition; Hammered Sold at $1,900,000 plus commission of 10.00%; Final Price $2,090,000. With Reserve– – Freshly restored and show quality from ten feet. 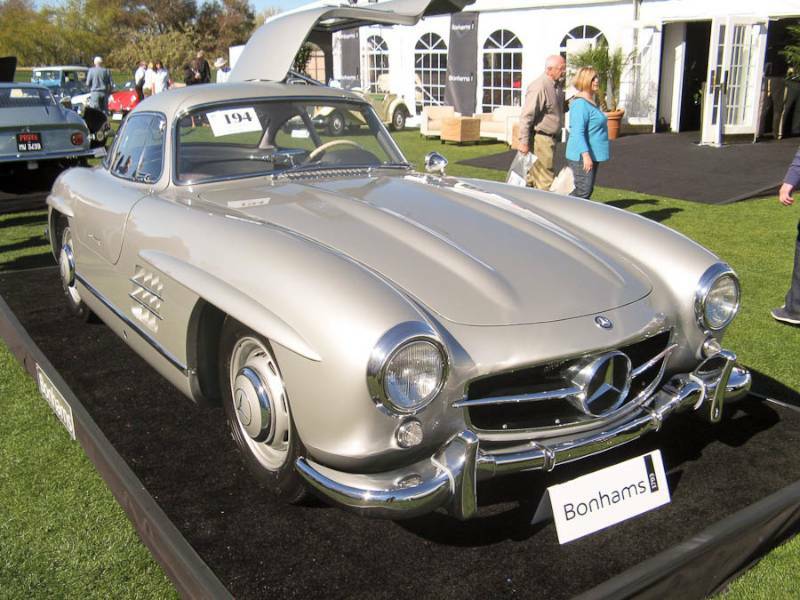 – Barrett-Jackson gets some extraordinary prices for Gullwings. 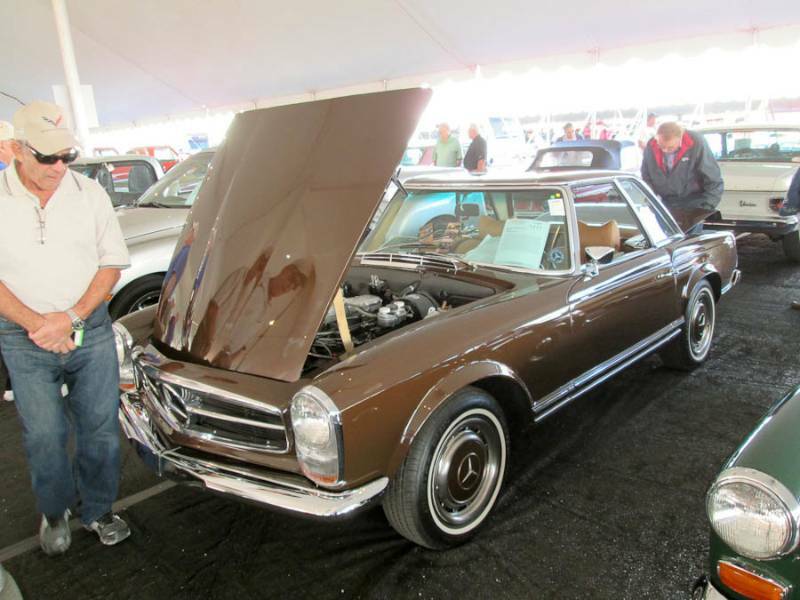 Lot # 1171 1969 Mercedes-Benz 280SL Convertible; S/N 12005126; Brown, /Tan; Tan top; Cosmetic restoration, 2 condition; Hammered Sold at $45,000 plus commission of 10.00%; Final Price $49,500. No Reserve– Automatic, two tops, factory wheels, factory air conditioning, Becker Europa AM/FM radio, leather upholstery, owner’s manual, spare tire, tool kit. – Excellent paint, chrome in fair shape with light pitting and minor scratches. Wheels are in great shape without nicks or other road rash. Engine bay has been thoroughly detailed. Excellent seats, carpet and dash round off an already good-looking interior. – The Pagoda SL market is somewhat befuddling. Fresh world-class restorations on well-equipped cars vault prices well into six figures in the right venue, while slightly less impressive examples can sometimes sell at a 50% discount. This 280SL, aided by its two tops, is a quality driver done by professionals to an acceptable standard of presentation and brought a realistic price. Can someone send a message to the younger generation that the 190 is a real turd to drive and should never ever have gotten so high $. I believe an old person accidentally bought a 190sl thinking it was a 300 and that is what made the prices go nuts. It disgusts me that the 190 is worth as much a 300sl roadster was 5-7 yr ago. Looking at the 190 SL’s that sold for extreme money, proves a point. that having money, doesn’t make you smart. Eight to ten years ago you could have your pick for $10 k.
I PURCHASED A BRAND NEW 1958 190SL IN FRANKFURT FOR $4500 AND I THOUGHT I OVERPAID BASED ON IT’S PERFORMANCE,NOT MUCH OF A CAR JUST A TOURING CAR. The book ” Extraordinary Popular Delusions and the madness of Crowds ” by Charles Mackay about Tulip Mania in 1637 pretty much explains the whole 190 SL thing , and great work Rick , Thanks ! Fully agree that the 190sl is certainly not worth anywhere near the prices they fetch and is downright mediocre when compared with its big brother. Had 300sl roadster for many years and damn sorry I ever sold it, it is an engineering masterpiece.